Could Lazy Boys Answer America’s Movie Problem? Movie theaters around the country are now using a new method to lure people to their screens: reclining seats. In the past few years, many Americans have opted for movie services like Netflix and Amazon Prime rather than going to the theater for their entertainment. “There are no more bodies coming through the door,” said Eric Wold, an analyst at B. Riley & Co, an investment bank. “So you have to find something to get them to come back more often or pay more,” he added. Because of this, some theaters are choosing to switch their seats to recliners. Marcus Point Cinemas has already changed its seats, and AMC Star Cinema in Fitchburg is likely to make this move soon, too. It would cost AMC $600 million, plus an extra $350,000-$500,000 to refurnish each theater. Theaters making this change would also lose two-thirds of their seats. Not every AMC theater in the country would get new recliners. New York and Los Angeles theaters, for example, would probably stay the same because they already have so many customers. The new seats “won’t go to every location in the country. We’re looking at each theater individually and examining the business scenario there,” said Kyle Noonan, AMC Theaters spokesman. 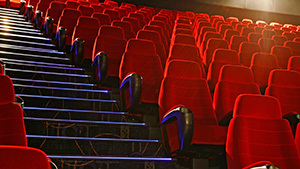 Even though these newly-furnished theaters will seat fewer people, theater owners are hoping that their quality over quantity seating decision will pay off. They hope, too, that an increase in people returning to movie theaters for this luxurious experience will turn their business around.